Thank you for this info, as usual. Sad to relate, about one half of one percent of smokers in Great Britain are pipe smokers. (I shall allow you a moment or two to recover). As a result, there are relatively few tobacconists of the old school; mostly they sell newspapers, cigarettes and rolling tobacco, with perquisites. 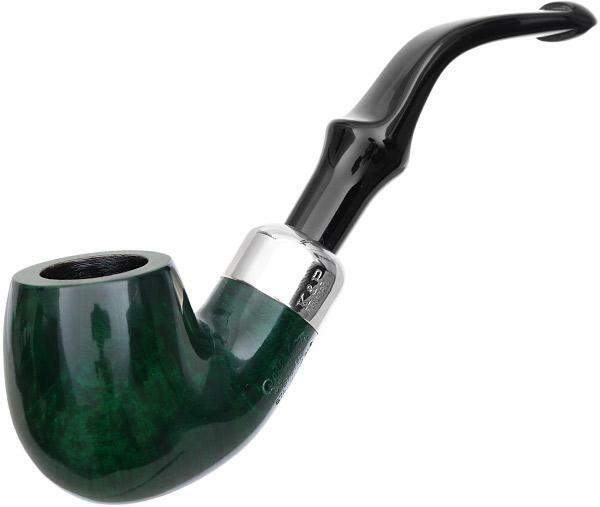 I have been pleased to find a thriving pipe smoking community in the US of A, However, and at risk of a midnight visit from the Inquisition, I cannot really say that I like the trend toward pipes in various colours, vinyl mouthpieces and the slow disappearance of the P-lip. There, I have said it, and will now go and barricade my house from the angry hordes. I can only hope that Laudisi prove to be faithful stewards and that pipe smokers everywhere can continue to enjoy the pleasure of a quiet pipeful. Richard, you are a man after my own heart. 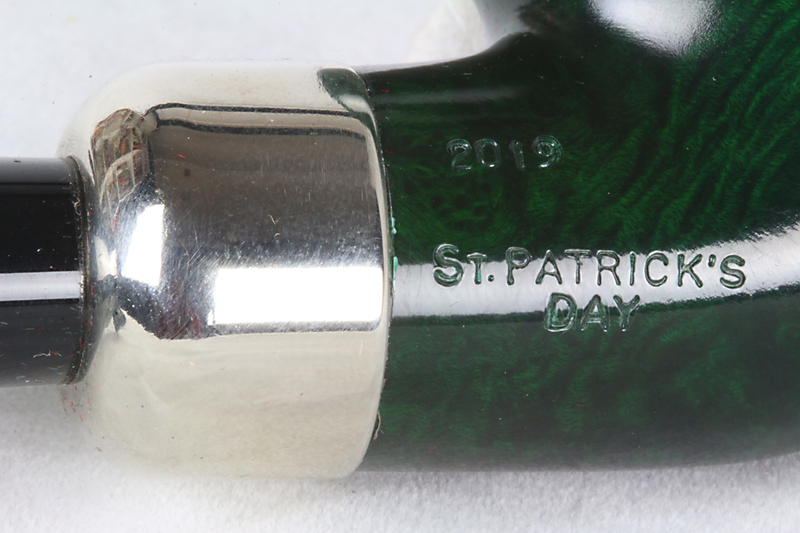 Peterson is actually working this year on upgrading mouthpieces, and I know vulcanite has once again asserted itself here in the States and even somewhat across the pond (German artisans rarely use anything else, unless it’s juma, which is almost identical in its properties). For all its problems, vulcanite is still the best. And it’s interesting that an artisan can use a high-grade rod that doesn’t seem nearly as susceptible to oxidation, isn’t it? Yes, I’d love to learn from some lore-master about why some vulcanite rod is better than other. We know, for instance, that Peterson’s hand-cut rod from the very first was of a higher quality than the pre-formed mouthpieces used on 2nd and 3rd grades, and I know that my artisan pipes with vulcanite don’t seem nearly as susceptible to dental chatter as even my best Petes. OK, Mark. I am not a pipe lore-master, but I did manage to pass organic chemistry a long time ago. Here are some facts, More can be found at https://en.wikipedia.org/wiki/Ebonite What we know as vulcanite is obtained by treating natural rubber for a long time using a process called vulcanization. In the “industry” the term vulcanite is no longer used, but has been replaced by Ebonite. The amount of sulfur and the applied temperature and duration during the vulcanization process are the main variables that determine the properties of the polysulfide elastomer. The UV in daylight causes oxidation and exposure to moister allows the water to bond with free sulfur on the surface causing sulfates and sulfuric acid to form. The sulfates condense water from the air, forming a hydrophilic film with favorable wettability characteristics on the surface. These aging processes will gradually discolor the surface grayish green to brown. Thanks, Stephen. I’m very impressed (I really am) that you passed organic chemistry. I wrote poetry during my chemistry class in high school–we had risers for lectures in one room and a lab in the other. One day, sitting alone and failing the class, I papered the trees outside the high school from the second story window of that class. Why I never got caught, I’ll never know. . . . So it sounds like a higher-grade of ebonite might have less sulfite? I’m going to check around with some of the pipe makers I know. If I find out anything of value, I’ll post it in an upcoming blog. Thanks, as always, good sir. Thank you for the explanation on the new series. I can’t wait to pick one up! You’re welcome, Bob. If you do, let everyone know how it performs. I’m interested in reactions to the finish and the mouthpiece, especially. I am getting the 302, and one of the online vendors had a deal on a rustic POY 2016. Will love to share my thoughts! This is basisly our shape 02 Tom Palmer told me when he showed me a new for production Lestrade. Jorgen, I think Tom is the greatest, but he’s wrong. Put on your reading glasses and get out your calipers. I have the two pipes sitting here in front of me, and they’re not the same. The bowl was basisly ( spelled right ? ) he said, also before they started working on it. I also have the prototype ? of the 1995 Christmaspipe for Danmark. The agent gave it to me with order not to smoke it in public as it have a rather large unfilled flaw. Otherwise it is a fine pipe. This one was basis for those who came on the market, they were smaller. 400 pieces as far as I remember. So, my question is: what is the difference between shapes 05 and 305? Is there any difference? And yes, I am excited about getting a few of this year’s SPD. The 305 and 304 (the latter is quickly becoming another favorite of mine, but they’re hard to find) in fishtail (yes, fishtail) will soon be gracing my racks. Hi David. There’s a cross reference chart waiting for you on p. 268 in the Peterson book that explains all. Your 05 shape entered the catalog as the calabash shape (5b, actually) in 1984. It was enlarged to create the Original SH pipe, which became the XL5 and XL15 (US production) as non-Systems and the XL305 and XL315 (US only) as System pipes. It is the XL5s in DeLuxe System, and the 75 and XL75 as the Dunmore Premier. A “305” 2018 SPD? If so, it was stamped incorrectly, as that number is for Systems. It should be an 05. Anyway, if you shine a flash into the 2018 SPD you should NOT see a reservoir. If you do, it has been drilled for a System and really really wants a P-Lip to make it function at its best. So: 05 is a Classic Range. Shouldn’t have a reservoir. 305 is a System. And if you’re feeling the spirit of Charles Peterson hovering over you, it’s becasue I’ve asked him to haunt you until you try a P-Lip System! LOL. Yes, it’s definitely a 2018 SPD shape #305. It’s clearly stamped that way. Some e-retailers still have them displayed on their sites (even if most say “sold out”) so I know mine wasn’t some kind of mistake. Check your blog #75. I have the 31, 304, 305, 338, and (of course) B10 from 2018 SPD. I would be surprised if you aren’t companioning a 338, as I recall that’s one of your favorite shapes. My 305 does have a reservoir. At least the 2018 SPD does. The 2019 305 is on it’s way (hurray!) along with a 304 to keep it company, so I haven’t seen it yet. Although the reservoir is a given for this year. I’m traveling now, so I can’t check my collection, but as I recall, all my 05 pipes have a reservoir. I never had a 305 until the ’18 SPD. Now, perhaps the reservoir is smaller on the 05? Or something else different? As I wrote earlier, I can’t find any difference between the two shapes, inside or out. When I get home, I’ll check a few 05s for reservoirs. I brought my SPD 305 along on the trip. The photo you have posted here, looking inside, matches my memory from all my 05s. And yes, I’m excited about the book and certainly plan to order a copy when it’s ready. I’m sure it will make a great Christmas gift too! Well, without going into details, there were a few *ahem* problems in getting bowls correctly stamped in the past few years. And even a problem or two with having Classic Range shapes mistakenly drilled for Systems. But we won’t go into that. All the “300” shapes are SUPPOSED to be Systems–that’s the shape group they’ve been in since that group was first numbered after it transitioned from the System Grade 3s in the late 1920s and early 1930s. Remember when you’re looking that the reservoir actually goes substantially beneath the draft hole–sometimes I first think “Oh, System drilling,” when really it’s just Classic Range. 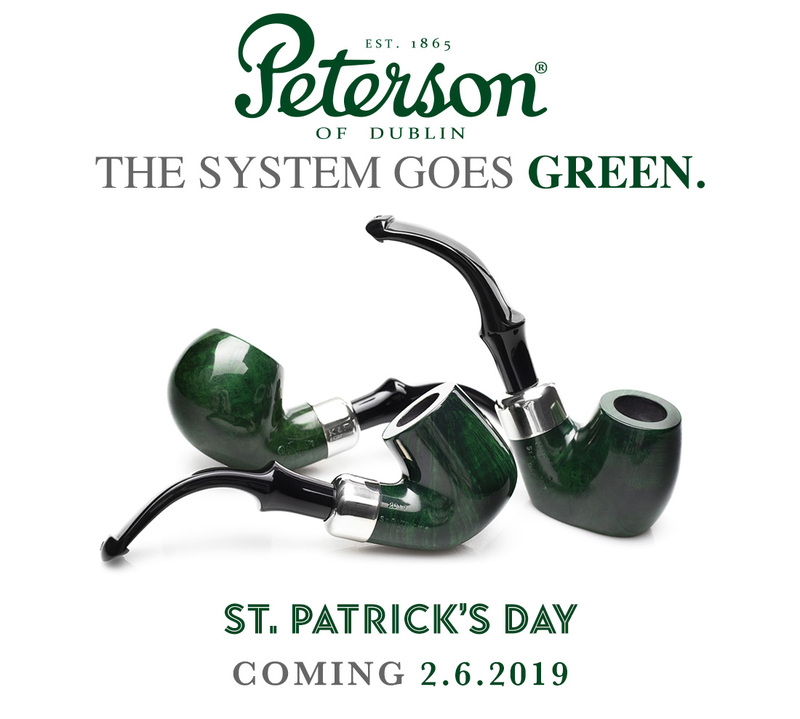 It’s a bold move to have only system pipes for St Patrick’s Day. 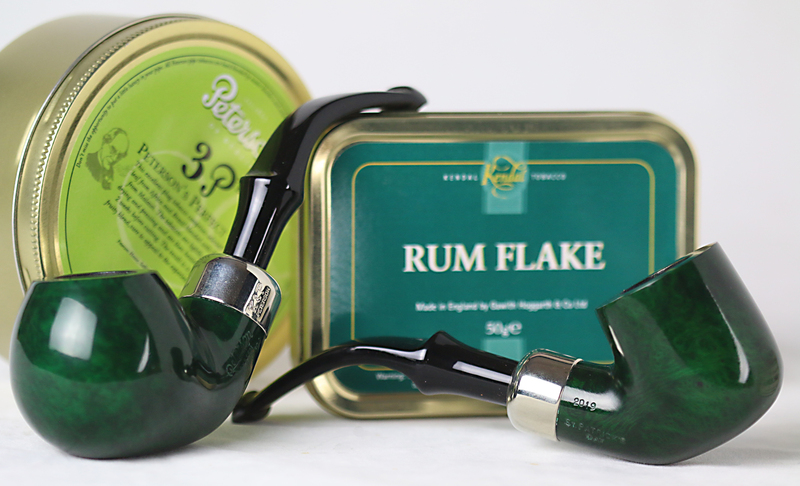 It might encourage some, especially collectors, to try a system pipe, who otherwise might never try one. I only hope it doesn’t backfire on them. By not offering even a single straight shape, they are excluding anyone who smokes only straight pipes. I have no idea what percentage of the population that might be, but I’m sure there must be some out there. They could have at least included the 31 straight system and still be consistent. I admit, I’m disappointed my beloved B10 wasn’t included this year. Oh well, I can’t expect it to be in every line. But still, there’s not much variety here. I do wish they had included some of the more popular traditional shapes, such as the 999, or 69, or maybe the 408. I think this year’s SPD will either bring some new customers to the system pipes who otherwise would never have tried them, or it might alienate those who don’t want to venture outside the classic range. Maybe a little of both. Time will tell. I am very pleased that they’re offering the line in fishtail mouthpieces (or so the advertising says), and thrilled that they’re using acrylic stems. I am so tired of watching my vulcanite stem Petes slowly turn the inevitable greenish brown over the years. Acrylic stems also make the color possibilities practically endless. Here’s hoping they continue along those lines. Well, it’s only a single year in the SPD, and it’s a gutsy opening move for the Laudisi Peterson, to reassert the primacy of THE Peterson pipe. Shape 31 was discontinued last year, sad to say. But all your favorite Classic Range shapes should return with next year’s SPD. Oh, and watch out–the ghost of CP is coming for you!! Mark! Please tell me they will have a Christmas pipes or 2019!! My wife will divorce me for money, but I will at least keep my Petes. I don’t think we need to worry about the Christmas pipe. Peterson led the way with that commemorative, and I doubt Laudisi-Peterson will mess with success. I loved the copper ferrule on the 2018, but couldn’t get one in the XL02 that hadn’t been drilled for a System, so I had to let it pass. Sob. I noted that apparently no straight pipe is offered. I’ve got enough bent and system pipes in my collection and now prefer straight pipes. I probably will hold off on buying this one. You bet, Tom. Spread the word. With the demise of the 31 System (straight), there isn’t a straight offering. I’ll be lobbying for the return of the 120 System dublin, or possibly a bulldog straight System–but the bowl has to be enormous to give it a decent chamber. 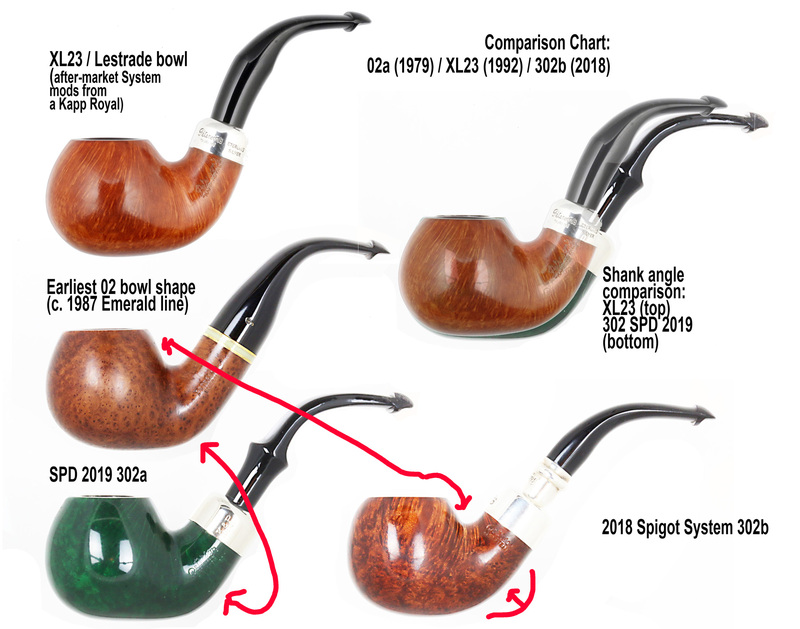 Mark, I noticed your observation on the XL02/XL23 shapes and decided to look at the current inventory of (XL02) shapes on SmokingPIpes.com. It looks to me that there are several XL23 shapes intermixed across several of the Peterson lines. Also, I vote for a 120 System Straight Dublin. They could probably take a Great Explorers “Crean” and drill it for a system. Hi John, I looked at Smokingpipes, like you, and didn’t see any of the XL23’s masquerading as 302’s, but who knows? they may have already sold. Looking just now, it looks like the first batch sold pretty well. As for straight Systems, Peterson had several shapes in the 1906 catalog, but for most decades since it was just the tiny 31. The 120 and the X86 (the apple shape, if I have the number right) were released twice as Systems–in the 1950s and again in the early 1980s. The only thing it needs, as you surmise, is a very thick stummel, which most straight Petes have. Wow, the Crean! That would be awesome, but there’s still that drilling to consider–the reservoir actually pokes its drafthole into the underside of the chamber at the rear, instead of from the side, necessitating a shallower chamber. It is kind of cool, though–the Straight System is the very Rare Bird among System users. The #31 I have looks to have a bone extension. I’m not sure if it is original, or how long Peterson used bone extensions in the #31? Yes, Peterson used bone until about 1963 or so, when they transitioned over to aluminum. Fine reading again. Thank you. Glad to hear someone else extolling the vulcanite as I can’t get on with acrylic stems too well. 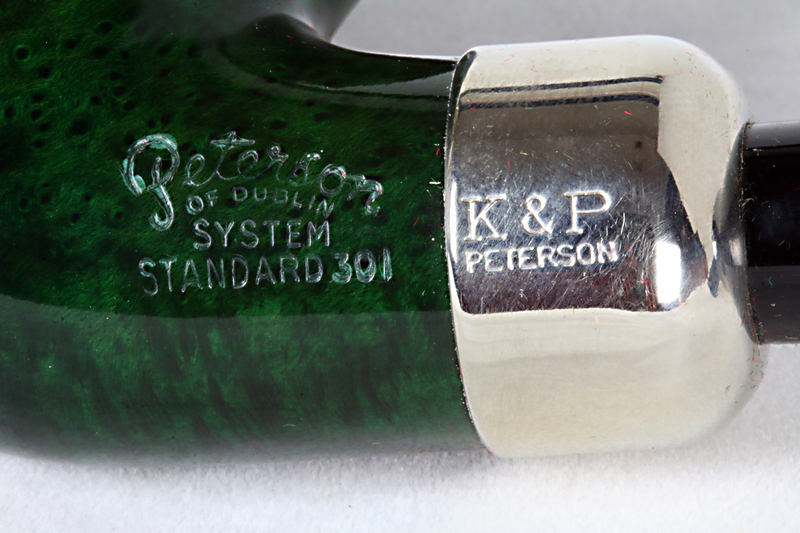 The grip just isn’t there, the material is too ‘glassy’ and the stem ends up sliding all round my teeth in an effort to get comfortable…a personal problem, you understand…the Petersons above are good looking pipes, the 301 in particular, but the colouring is an issue and I will not be investing, I think. This was fascinating reading. Thanks again. Thanks for the heads up. 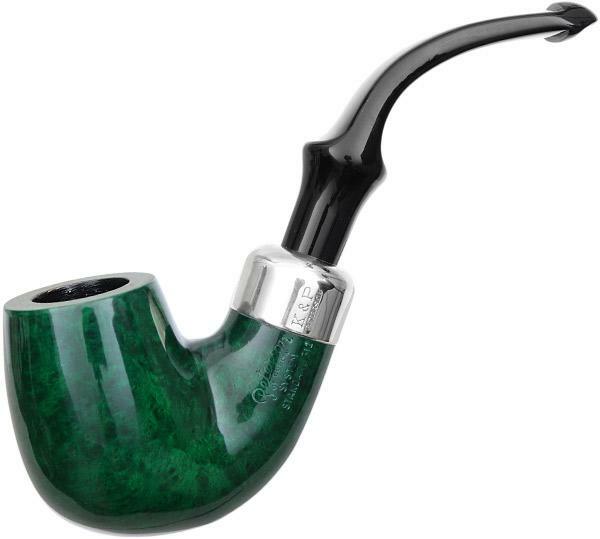 I went to smokingpipes at once to select a St. Patty’s Day pipe, but they had none listed. I went back at 1 p.m. and there they were! I ordered a 307 (p-lip, of course!) and it will be here tomorrow. Interestingly, they were almost completely out of stock of all Peterson tobaccos. I did pick up a pound of Sunset Breeze for cheap. I have found with the plastic stems that if I put one of the rubber sleeves on it I can clench it without breaking anything or scarring up the stem; it also stays in place. I know a lot of folks hate those things, but they are quite useful to me. Hi Stephen! I smoked a 2nd bowl in my 302 tonight & have always loved the 307, as it was “the Pete” of the young man who “converted” me Peterson back in the late 1970s! Not surprised to here about the Peterson tobaccos. If you didn’t know it, that part of the business was sold separately from the pipe company. I believe Kolhase & Kopp will continue the Peterson brands, but will have to check to be sure. I’ve become good at gripping the P-Lip acrylics, but not so much the fishtails. The important thing in all, of course, is to enjoy and relax with your pipes, which it sounds like you’ve figured out a way that works for you! I’m really sorry to hear your experience with the 313. I’m hoping you haven’t smoked it & have got it in the return mail by now. Josh Burgess, the new managing director at Peterson, is well aware of several issues he’s inherited & is working hard to get everything up to standard. I had a poor experience myself recently with the Christmas 2018 XL02—went through 3 of them, then just gave it up (they were all drilled for Systems!). If you’ve already smoked that pipe & your retailer won’t help, do let me know & I’ll get in touch with Peterson directly for you. I’m glad to hear it, John. 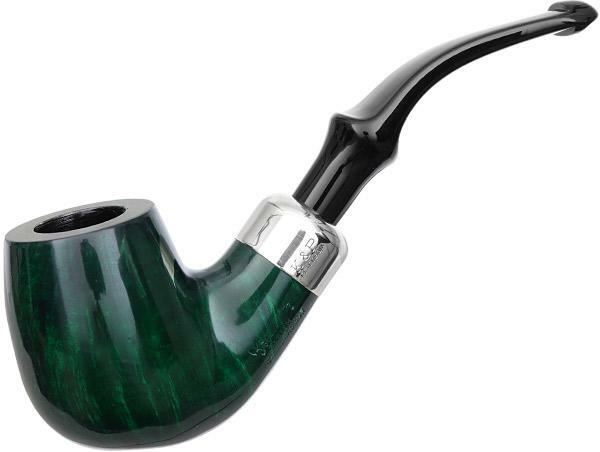 No reason to pay good money for a pipe and not have it be the best in its class. Hope the new one is at least as good looking as the one you return! John, I’m sorry you got a pipe in such poor condition. It sounds almost like it was moved to Shipping before it was ready. Can you go back to your dealer for a replacement? I got my 307 on Friday and have smoked it four times without any problems. It looked just like the on-line photo at smokingpipes.com where I bought it. 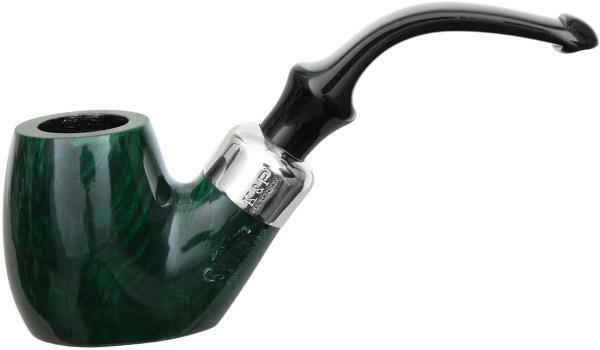 I’m sure you have heard by now that the same company that owns smokingpipes.com recently purchased the Peterson pipe manufacturing business. Thanks Stephen. I have heard that. Thanks for the info. I think this just happens to be one of those occasional “Lemon” pipes. I’m sure if I tried I could return it to Smokingpipes.com, they have excellent customer service, Peterson as well. I had to send a brand new Pete Calabash that burned through the front of the bowl almost as soon as I lit it back to Peterson (I think it had an internal pit?). Peterson had no problems sending me a replacement, but international shipping and payment is kind of a hassle. I’m not sure it’s worth the trouble having to deal with this pipe. I have bought probably 25 or more new Peterson’s since I started this adventure and another 30-40+ used Peterson’s, and none of the others have any drilling this far off. So, for how many pipes they crank out a year, not bad..nobody’s perfect. Hmm, I just got an estate older Deluxe #53. It has the draft hole drilled off to the left almost as much as that 2019 St. Patrick’s #313 that I returned🙁. It is in great shape and still smokes good though. A DeLuxe lovat 53 Peterson is seen in the hands of John Watson, aboard the train in one of the Rathbone – Bruce Sherlock Holmes films! Out of curiosity, how can you tell it is a Deluxe in a film, does it have a very, very, closeup, or are there other cues? My pipe does not have a silver band. I think I have seen other “older” deluxe models without silver, but I don’t know for sure. My pipe is labeled Deluxe, and it does not look like it ever had a band on it? It has believe it may have been refinished? The stem does not fit smoothly from shank to stem. The shank still has it’s nomenclature and the shank does not taper as if it has been sanded down. Usually a missing band will leave a mark. Kind of like when a married person takes off their wedding band. Hi John. 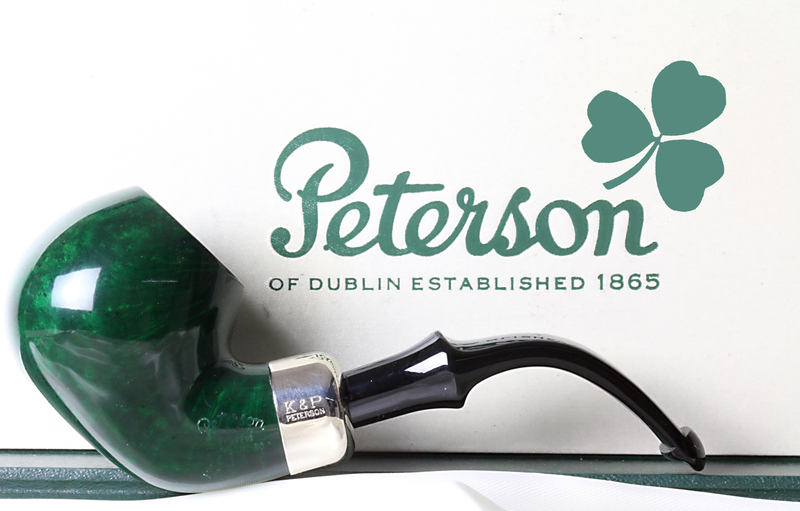 Your Peterson book will make this visually apparent, but through most of the 20th c. Peterson’s non-System pipes (“Classic Range”) were produced in Premier and DeLuxe (and sometimes Supreme) models that were never banded. The System range, on the other hand, will always feature a nickel, sterling or gold band or ferrule (apart from the Dunmore Premier Systems, which were made from c. 1981-1984 or so). If you have a particular pipe in mind, send me a photo & I can identify whether it originally had a band or not. Sounds like your pipe may be missing its band. I took some pictures of the Deluxe…upon very close inspection and scrutiny I think I may see a line where the band could have been, and possibly a very slight taper at the end of the shank. Shucks, it’s the second Deluxe I have that is missing the band. I really love both pipes though..the other is a #268. 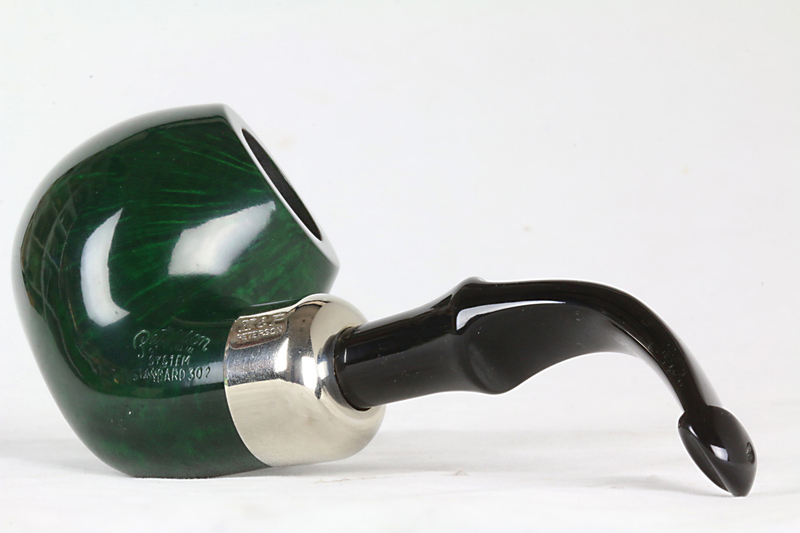 I originally bought the #53 thinking that it was a smaller pipe, the shape number was not very visible in the pics. It is quite a bit smaller than my other #53 though. I’m not sure how to send pics? Hi John, neither the 268 nor the 53 was typically made with a sterling band, although there was a “Sterling Silver” line in which they would have appeared thus. There were also smaller lovats than the 53 that were in production through the 1980s. Did you get the pics I sent? The band on the Deluxe #268 looks factory to me? It has a diagonal O in a clipped corner square, silver date hallmark Y2000? Oh, also, the stem of the Deluxe #53 has threads in the tenon. Yes, the DeLuxe Classic Range pipes would have tenon extensions, as evidenced by the threads. 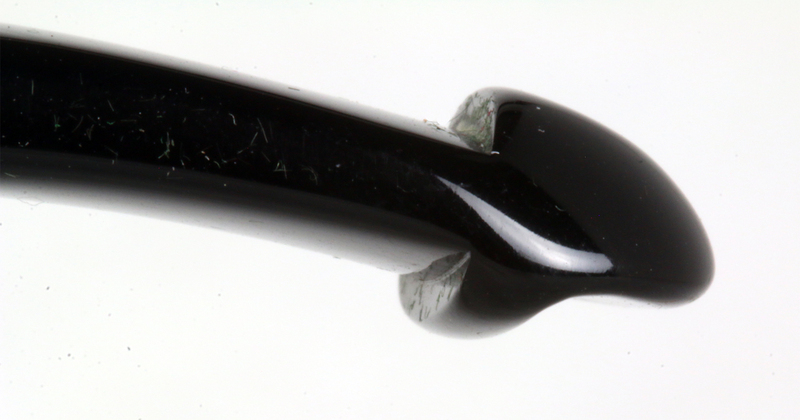 Many smokers unscrewed them and threw them away, thinking they were some kind of stinger, when in fact, as you can read about in the Peterson book in just a few months, they were part of what makes the P-Lip graduated bore work so well! It’s a joy to read such enthusiasm for Peterson Pipes. I only own 4 pipes. They are all Peterson’s! You’ve come to the right place, Joe! Four is fantastic and you’ve got the best there is. My dad only had two, the one he was smoking and the one in the drawer, the whole time I was growing up. Four would have been extravagant. Don’t ask me how many he had when he passed away!! I am so glad I found this blog, and in time for the sales! So happy I was able to get a SPD System pipe on sale. Your blog convinced me on the purchase. Thanks for sharing your knowledge with us, Mark. I’m glad you found it, too, Robert! Good luck with the SPD System. I’m cheerily breaking in an 02, which is moving along nicely. I just received my replacement Pete #313 2019 SPD pipe. The draft hole is perfect, it was clean, it does not have any fills, just a couple very teenie, tiny, itsy, bitsy sand pits. The stamping is decent, not the strongest I have seen, but at least it is all present. Best of all…..(on top of no fills)…it is cut cross-grain almost perfectly right down the center, and very good birdseye on both flanks. I think this stummel could have been a higher grade pipe it’s so nice. Customer service at SmokingPipes.com is the greatest too. Well I’m relieved & excited the wood turned out to be better than the original. Happy Smoking! 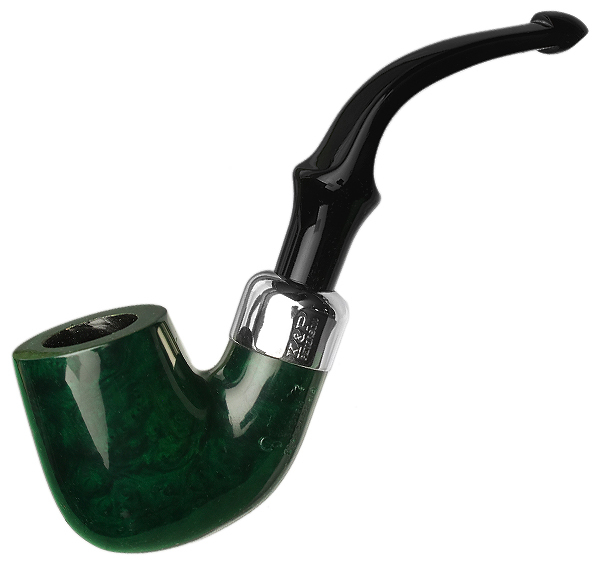 As mentioned above I received my St. Patrick’s pipe and began smoking it with no problems. All of a sudden, yesterday, a spot on the finish bubbled up and changed to a bright green. 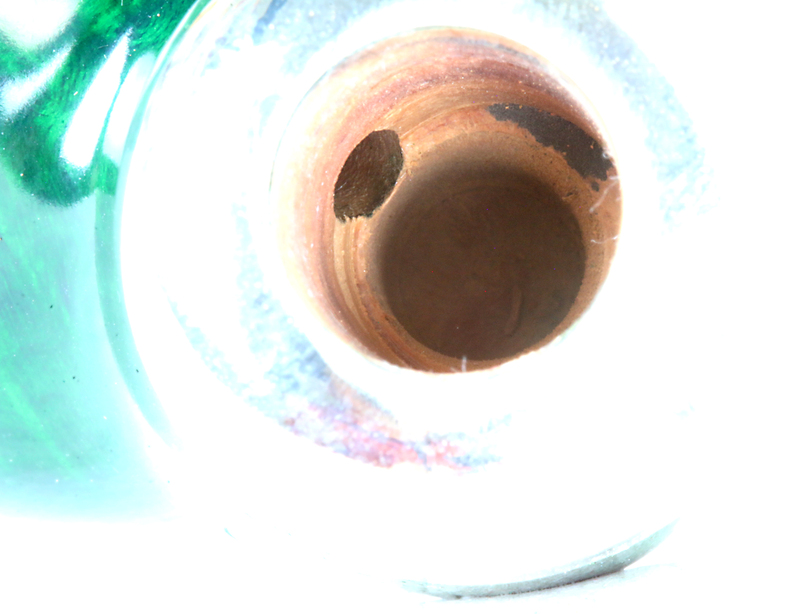 The pipe was not overheated and the rest of the finish is fine. I expect that to fix this I shall have to sand the area down to the wood with progressively finer grits, stain it green several times, then finish with carnuba. Do you happen to know which green stain will work best for this? Or, if this is not the correct process, what steps should I follow? I’m depending upon your vast Pete knowledge! Thanks! Stephen, as one of my great mentors, the funny-looking kid with the round head would say–“AARRRGGGGHHH!” Only a Pete Nut like yourself would put up with such a thing. 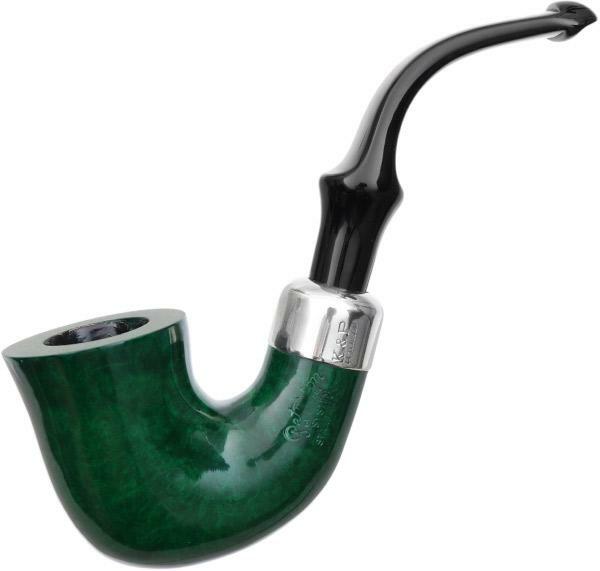 I confess that, since the introduction of the Racing Green commemorative in 1997, I have always been reluctant to actually companion a green-stain pipe. I’ve seen older ones with discoloration, mottling, even having the green stain completely missing, and just thought there’s other pipes. This year I couldn’t help myself, the SPD being a System. My wife suggested, mockingly, that I wear a little white glove while smoking it, like we used to do with meers back in the 80s. So I can feel your discouragement. Part of me would want to get my $ back and rant a little about it to Peterson directly. If you want to keep it, use Fiebing’s green leather dye. Be sure a dilute it about 1 drop of stain to 6 of isopropyl and have a cotton pad handy to wipe off excess. If the spot is small, use a q-tip. I don’t know if I’d sand it down or not, depending on the size of the restaining job. I might just use an 800 grit Micro Mesh to roughen the surface a bit. This type of finish would do better with some selective white diamond, if you have a small buffing wheel. Thank you so much for your prompt and informative reply. I own about 20 Peterson pipes and rarely smoke anything else. As an engineer, I take it as a challenge to repair a pipe as pretty as the St. Pete’s. I have repaired several burn-throughs in the past with very good results. Now that I am retired I have plenty of time. I’ll let you know how it turns out. I just picked up one of the 2019 SPD’s, the 307 large billiard. Haven’t yet smoked it, but it looks fantastic and it’s my first system pipe. The only question I have is about the inside of the chamber. I’m not a Peterson expert at all (I’m still breaking in an unstained Burren which is my first and only other Peterson), so I’m overall pretty unfamiliar with them. Here’s my question: on the 2019 SPD, is the inside of the chamber stained, or is it just pre-charred carbon of sorts? Thanks for all your info and expertise in the Peterson world! Thanks so much, Mark, that’s such helpful info! When you say ‘until quite recently,’ do you mean that the 2019 SPD’s still have the vegetable-oil based product, and since then there has been a newer treatment, or do the 2019 SPD’s have the newer treatment? Looking forward to the piece on the new coating! Keep up the great work. I talk about this in the new bowl coating post, Jeff, but as far as I know, the 2019 SPDs did not have the new chamber coating. Mark, what ever happened to the practice of treating a new pipe bowl with a very thin layer of honey? When I was getting started, I was told to put a small amount of honey on my little finger and rub it all over the inside of the bowl, let it sit for a few minutes then smoke the pipe slowly. The idea was that the honey will carmelize and “jump start” the caking process. I can’t remember ever actually tasting the honey, but this process worked for me. Hi Stephen, I know some folk still recommend this, and if it works for you, then by all means continue. All it ever did for me was give me a nasty case of tongue-burn. Better to take the factory coating out completely, then replace it with Charles Lemon’s recipe: coat the walls with maple syrup, fill the bowl with charcoal powder, dump out the powder and let the bowl dry for 3 days. Then lightly blow out any loose remaining charcoal powder. I can vouch for this, using it on all my personal restorations. I don’t use it when I’m selling estates as I believe it’s a matter of preference, but this gives the bowl a very clean taste as well as hastening the carbon-cake formation. You hit it on the problem with this method: I’ve accidentally removed stain on the outside of the bowl because I’m just not coordinated enough. But you’re preaching to the choir here, because I believe bare walls are best. Butfactories and artisans alike want something that looks good and gives everyone some insurance.